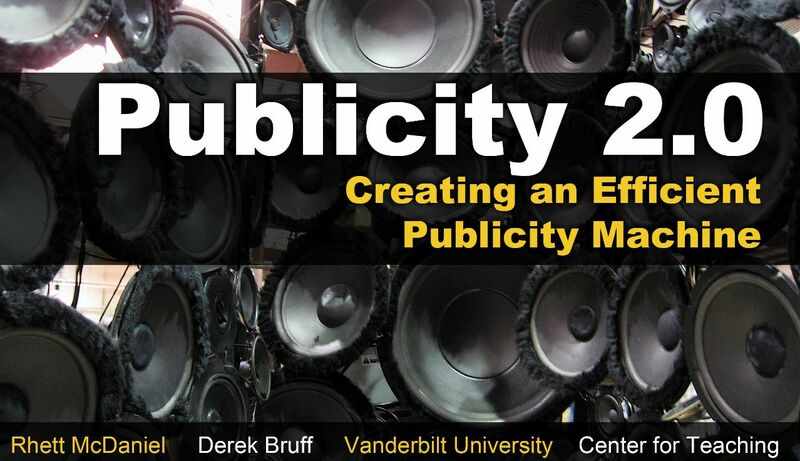 In addition to our work at Vanderbilt, Center for Teaching staff members contribute to the broader higher education community through publications. Our scholarly work includes research in our “home” disciplines, the scholarship of teaching and learning, and the scholarship of educational development. Since its founding in 1986, the CFT’s contributions to the literature on teaching and learning in higher education has taken many different forms. Below is a list of a few of our contributions. This list is not intended to be comprehensive; instead it is meant to give a sense of the kinds of topics our staff members have explored in past publications. 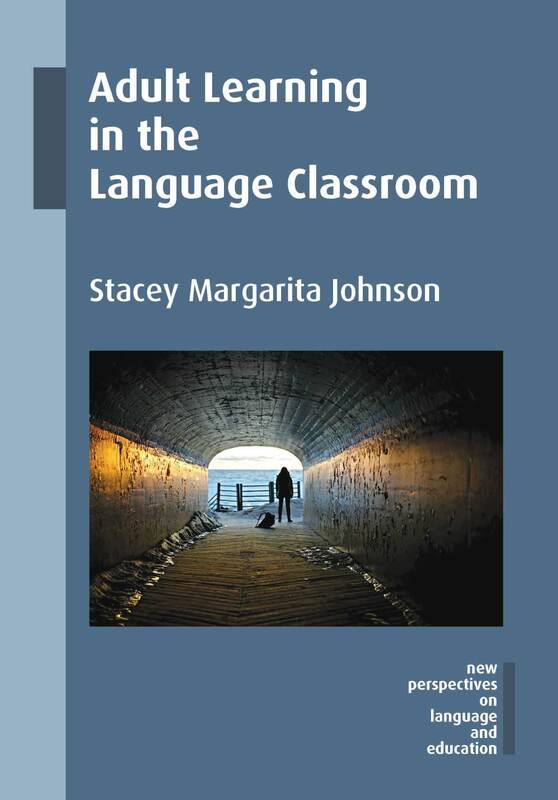 This book by CFT assistant director Stacey Johnson explores the intersection of adult learning theory and language teaching practice. 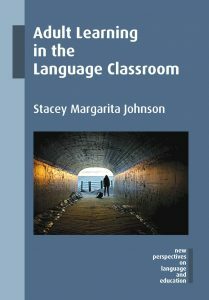 In their work, CFT regularly draw on educational theory and research to understand discipline-specific teaching and learning practices, often by gathering and analyzing evidence of those practices, as Johnson does in this volume and her previous work, Hybrid Language Teaching in Practice: Perceptions, Reactions, and Results (Stylus, 2015). More information on Johnson’s scholarship is available here. This volume was co-edited by Nancy Chick and was published while she was an assistant director at the CFT. It’s a follow-up to Nancy’s earlier work, Exploring Signature Pedagogies: Approaches to Teaching Disciplinary Habits of Mind (Stylus, 2009). 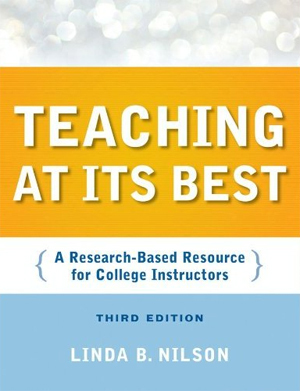 Both books feature invited chapters from scholars of teaching and learning on teaching practices that help students understand and develop ways of thinking core to different academic disciplines. Chick’s work on signature pedagogies has been transformative here at Vanderbilt and beyond. Chick now serves as the Academic Director of the Taylor Institute for Teaching and Learning at the University of Calgary. See Nancy Chick’s website for more information. 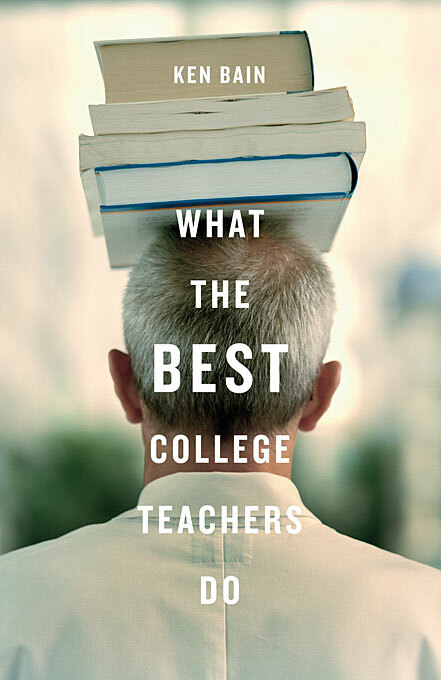 Founding CFT director Ken Bain has been studying outstanding college teachers for more than two decades. His 2004 book summarizes key findings of his study and relates those findings to cognitive science research. Although Bain’s book was published while he was the director of the Center for Teaching Excellence at New York University, he began his study right here at Vanderbilt, shortly after founding the CFT. Bain’s book is an example of how the CFT works to blend pedagogical theory with teaching practice. Linda Nilson wrote the first edition of this book, then subtitled “A Research-Based Resource for the Vanderbilt Teaching Community,” while she was the director of the CFT. In the latest edition of her book, Nilson provides practical strategies for a wide variety of teaching modes and contexts, all well-informed by the research literature on teaching and learning. For several years, copies of Nilson’s book were given to new teaching assistants every August at the CFT’s TA Orientation. Classroom response systems, or “clickers,” are instructional technologies that enable teachers to rapidly collect and analyze students’ responses to multiple-choice and free-response questions during class. 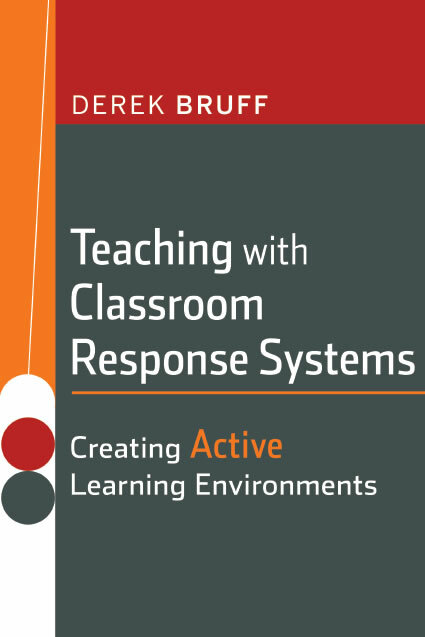 CFT Director Derek Bruff‘s book features example clicker questions and activities from 50 instructors from a wide variety of disciplines and types of institutions. The book grew out of an online resource guide to teaching with clickers that Bruff wrote at the CFT, and is an example of the CFT’s continuing interest in educational technology. For more on Bruff’s work, see his website, Agile Learning. In this 2007 essay, then-CFT director Allison Pingree argues for the importance of incorporating discussions of spirituality, meaning, and purpose in the classroom, and provides practical strategies for doing so. Later, CFT assistant director Kat Baker and others would continue exploring this topic, resulting in the creation of a contemplative pedagogy working group at Vanderbilt. Senior CFT staff members regularly teach courses at Vanderbilt and use those courses as opportunities to explore different aspects of teaching and learning. 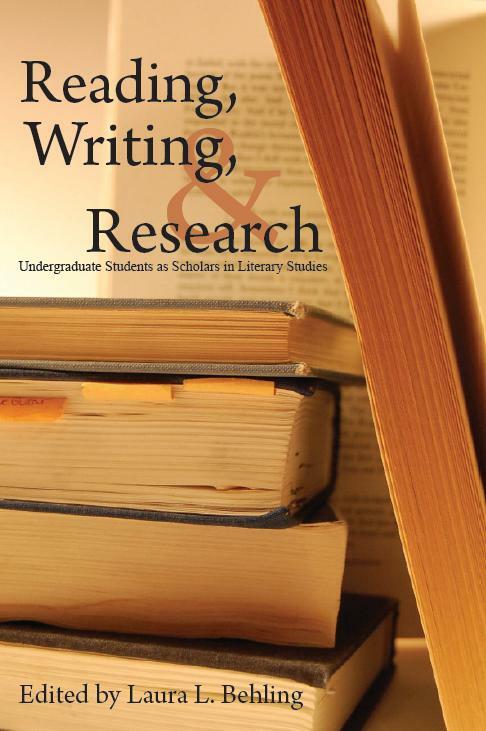 In this 2007 article, CFT assistant director Patricia Armstrong reports on her introduction of undergraduate research in a course she taught on French literature. Armstrong’s article is an example of how instructors can practice a scholarship of teaching and learning (SoTL). See our resource guide on SoTL for more on this topic. Not only do CFT staff members explore issues of teaching and learning in a scholarly manner, but they also take the same approach to their own work as educational developers. This national conference presentation by CFT educational technologist Rhett McDaniel and director Derek Bruff is an example of how CFT staff members share their work with their professional community. Bandy, J. (2018). Created Opportunities for Students to Apply Course Content Outside the Classroom. IDEA, http://www.ideaedu.org/Resources-Events/Teaching-Learning-Resources/Created-opportunities-for-students-to-apply-course-content-outside-the-classroom. Knight, J. K. and Brame, C. J. (2018). An introduction to the Peer Instruction Evidence-Based Teaching Guide. CBE Life Sciences Education, https://lse.ascb.org/evidence-based-teaching-guides/peer-instruction/. Wilson, K. J. and Brame, C. J. (2018). Helping practitioners and researchers identify and use education research literature. CBE Life Sciences Education, DOI: 10.1111/idh.12334. Wilson, K. J., Brickman, P., and Brame, C. J. (2018). Group Work. CBE Life Sciences Education, DOI: 10.1187/cbe.17-12-0258, https://lse.ascb.org/evidence-based-teaching-guides/group-work/. Bowen, R. S., Picard, D. R., Verberne-Sutton, S., and Brame, C. J. (2018). Incorporating student design in an HPLC lab activity promotes student metacognition and argumentation. Journal of Chemical Education, DOI: 10.1021/acs.jchemed7b00258. Garrett-Rucks, P., and Johnson, S. M. [Eds.] (2018). Dimension special issue: Social justice and critical pedagogy. Johnson, S. M. (2018). An interview with Terry A. Osborn. Dimension, 9-15. Bandy, J., Bartel, A. S., Clayton, P., Gale, S., Mack, H., Metzker, J., Nigro, G., Price, M., & Stanlick, S. (2017). Values-engaged assessment: Reimagining assessment through the lens of democratic engagement. Michigan Journal of Community Service Learning, 23(1). Krimm, H., Schuele, C. M., and Brame, C. J. (2017). Viability of online learning for ensuring basic skills in speech-language pathology. Perspectives of the ASHA Special Interest Groups, DOI: 10.1044/persp2.SIG10.49. Hande, K., Parish, A. L., Cook, C., Glassford, M. A., Pitts, C. J., Richmond, A., Widmar, S. B., Brame, C. J., and Kennedy, B. (2017). Junior Faculty Teaching Fellowship: A model to support nursing education development. Nurse Educator, DOI: 10.1097:NNE.0000000000000413. Randolph, L. J., & Johnson, S. M. (2017). Social justice in the language classroom: A call to action. In Garrett-Rucks, P. (Ed. ), Languages: Your global fast pass (pp. 9-31). Southern Conference of Language Teachers. Grenfield, J., Johnson, S. M., and Finch, V. (2017). Students as producers, curators, and consumers of authentic resources through participatory pedagogy on-campus and abroad. In S. Dubreil and S. L. Thorne (Eds. ), Engaging the world: Social pedagogies and language learning (pp. 227-252). AAUSC Issues in Language Program Direction. Boston, MA: Heinle. Finch, V. and Johnson, S. M. (2017). Collecting Authentic Language and Culture. The Language Educator, 12 (4), 47-48. Bandy, J. (2016). Learning to apply knowledge and skills to benefit others or serve the public good. IDEA Notes on Learning. IDEA. Biel, R., & Brame, C. (2016). Traditional versus online biology courses: Connecting course design and student learning in an online setting. Journal of Microbiology & Biology Education, 17(3), 417-422. Brame, C. (2016). Effective educational videos: Principles and guidelines for maximizing student learning from video content. CBE–Life Sciences Education, 15(4). Green, N., McMahon, D., & Brame, C. (2016). Using online active-learning techniques to convey time compensated sun compass orientation in the Eastern North American monarch. Journal of Microbiology & Biology Education, 17(3), 430-435. Hamrin, V., Vick, R., Brame, C. J., Simmons, M., Vanderhoef, D., and Smith, L. (2016). Teaching a systems approach: An innovative quality improvement project. Journal of Nursing Education, 55, 209-214. Chick, Nancy L. (July 2014). “‘Methodologically Sound’ Under the ‘Big Tent’: An Ongoing Conversation.” International Journal for the Scholarship of Teaching and Learning, 8(2): article 1. Chick, Nancy L, Cornell-Swanson, La Vonne, Lazarides, Katina, & Meyers, Renee. (July 2014). “Reconciling Apples & Oranges: A Constructivist SoTL Writing Program.” International Journal for the Scholarship of Teaching and Learning, 8(2): article 13. Chick, Nancy L. & Poole, Gary. Founding co-editors. (March, September, 2014). Teaching & Learning Inquiry, the journal of the International Society for the Scholarship of Teaching and Learning (ISSOTL). Bloomington, IN: Indiana University Press. Bandy, J. (2014). “Environmental Justice and Environmental Health in Nashville.” Chapter in Shaping Healthy Communities: Nashville. 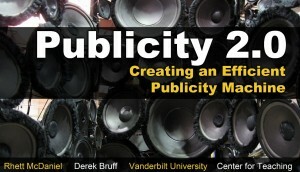 Nashville: Nashville Civic Design Center and Vanderbilt University Press. by Christine Kreyling. Bandy, J. (2013). Collaborative and Rigorous Assessment: The St. Louis Regional Arts Commission’s Community Arts Training Institute. Imagining America’s Assessment of the Practices of Public Scholarship. Chiang, H., Robinson, L. C., Brame, C. J., & Messina, T. C. (2013). Molecular Mechanics and Dynamics Characterization of an In-Silico Mutated Protein: A Stand-Alone Lab Module or Support Activity for in Vivo and In Vitro Analysis of Targeted Proteins. Biochemistry and Molecular Biology Education, 41: 402-408. Chick, Nancy L. & Poole, Gary. Founding co-editors. (March, September , 2013). Teaching & Learning Inquiry, the journal of the International Society for the Scholarship of Teaching and Learning (ISSOTL). Bloomington, IN: Indiana University Press. Chick, Nancy L. (2013). Difference, Power, and Privilege in the Scholarship of Teaching and Learning: The Value of Humanities SoTL. In Kathleen McKinney (Ed. ), The Scholarship of Teaching and Learning In and Across the Disciplines. Bloomington, IN: Indiana University Press. 15-33. Chick, Nancy L. (2012). Co-editor, with Aeron Haynie and Regan Gurung. Exploring more signature pedagogies: Approaches to teaching disciplinary habits of mind. Sterling, VA: Stylus, 2012. Chick, Nancy L. (2012). With Aeron Haynie and Regan Gurung. Signature pedagogies in the liberal arts and beyond. In Chick, Haynie, & Gurung (Eds.) Exploring More Signature Pedagogies: Approaches to Teaching Disciplinary Habits of Mind. Sterling, VA: Stylus, 2012. 1-11. Cox, M. D. (2012). The impact of communities of practice in support of early-career academics. International Journal for Academic Development. Cox, M. D. (2012). Foreword. In S. Sipple & R. Lightner (Eds. ), Faculty learning communities in two-year colleges: Sustaining teachers and scholars. Sterling, VA: Stylus. Cox, M. D. (2012). Foreword: The Big One. In P. G. Beidler, Risk teaching: Reflections from inside and outside the classroom. Seattle, WA: Coffeetown Press. Cox, M. D., Richlin, R. & Wentzell, G. W. (2011). Similarities and divergences in student and faculty learning communities: A message from the editors. Learning Communities Journal, (3), 1-2. Wright, M., Niemer, R., Bruff, D., & Walle, K. (2012). Tweeting #PODHBCU: Content and process of the 2011 POD HBCUFDN conference Twitter backchannel. To Improve the Academy, 31, 311-327. Bandy, J. (2011). Sociologists in Action: Joe Bandy & Elspeth Benard. In K. O. Korgan, J. M. White, & S. K. White (Eds. ), Sociologists in Action. (pp. 193-7). SAGE Publications. Bandy, J. & McEwen, C. (2011). Housing and Homelessness in Maine: A Case of Public Sociology in Practice. In K. O. Korgan, J. M. White, & S. K. White (Eds. ), Sociologists in Action. (pp. 128-34). SAGE Publications. Bruff. D. (2011). Engaging Statistics Students with Classroom Response Systems. In Cline, K., & Zullo, H. (Eds. ), Teaching Mathematics with Classroom Voting: With and Without Clickers. Washington, DC: Mathematical Association of America. Bruff, D. (2011). A Social Network Can Be a Learning Network. Chronicle of Higher Education, November 6, 2011. Bandy, J. (2010). Sociologists in Action: Joe Bandy. In K. O. Korgan & J. M. White (Eds. ), The Engaged Sociologist, Third Edition. (pp. 9-10). SAGE Publications. Bruff, D. (2010). Multiple-choice questions you wouldn’t put on a test: Promoting deep learning using clickers. Essays on Teaching Excellence, 21(3). Bruff, D. (2009) Teaching with Classroom Response Systems: Creating Active Learning Environments. San Francisco: Jossey-Bass. Walker, D. G., Stremler, M. A., Johnston, J., Bruff, D., & Brophy, S. P. (2008). Case study on the pedagogical impact of tablet PCs as a presentation medium in engineering classrooms. International Journal of Engineering Education, 24(3), 606-615. Armstrong, P. (2007). Incorporating Undergraduate Research into a 17th-century French Literature Seminar. In L. L. Behling (Ed. 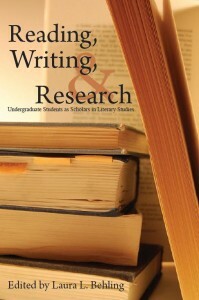 ), Reading, Writing, & Research: Undergraduate Students as Scholars in Literary Studies. Washington, DC: Council on Undergraduate Research. Bruff, D. (2007). Clickers: A classroom innovation. National Education Association Advocate, 25(1), 5-8. Bruff, D. (2007). Valuing and evaluating teaching in the mathematics faculty hiring process. Notices of the American Mathematical Society, 54(10), 1308-1315. Bruff, D. (2007). A TA orientation plenary session on university policies and resources for teaching. In Ross, C., & Dunphy, J. (Eds. ), Strategies for teaching assistant and international teaching assistant development: Beyond microteaching. San Francisco: Jossey-Bass. Felten, P., Kalish, A., Pingree, A., & Plank, K. (2007). Toward a Scholarship of Teaching and Learning in Educational Development. To Improve the Academy, 25, 93-108. Pingree, A. (2007). 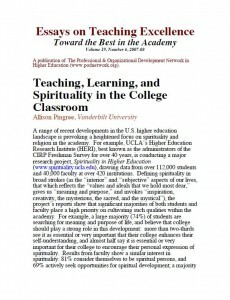 Teaching, Learning, and Spirituality in the College Classroom. Essays on Teaching Excellence, 19(6). Armstrong, P., Felten, P., Johnston, J., & Pingree, A. (2006) Practicing What We Preach: Transforming the TA Orientation. To Improve the Academy, 24, 231-246. Bandy, J. & Mendez, J. B. (2006). A Place of Their Own? Women Organizers Negotiating the Local and Transnational in Nicaragua and Northern Mexico. In Johnston, H. & Almieda, P. (Eds. ), Latin American Social Movements: Globalization, Democratization, and Transnational Networks. Lanham: Rowman and Littlefield.